Amidst the aromas of the International Flower & Garden Festival, you might just smell some new eats being cooked up at Epcot! 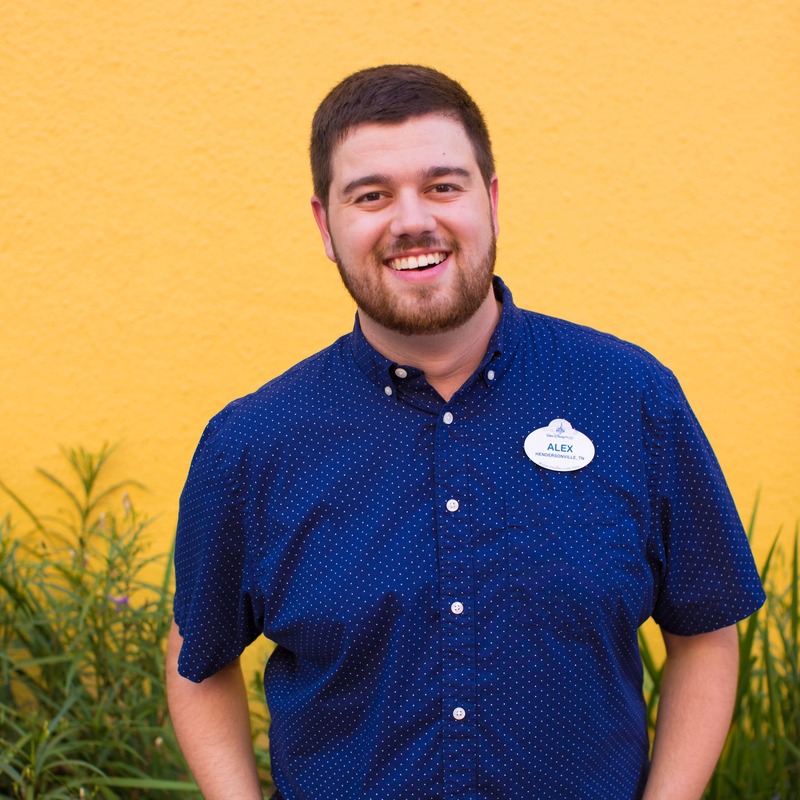 I’ve got new menu items at Refreshment Port, Electric Umbrella, Liberty Inn and more comin’ your way, so let’s take a trip around Epcot and I’ll dish out all the delicious details. We begin our journey in Future World, specifically Sunshine Seasons in The Land. Here we’ve got a couple new breakfast options that will be sure to kick-start your day in the park. The first is a Breakfast Croissant Sandwich – eggs, bacon, and Colby Jack on a flaky croissant and served with a side of breakfast potatoes. 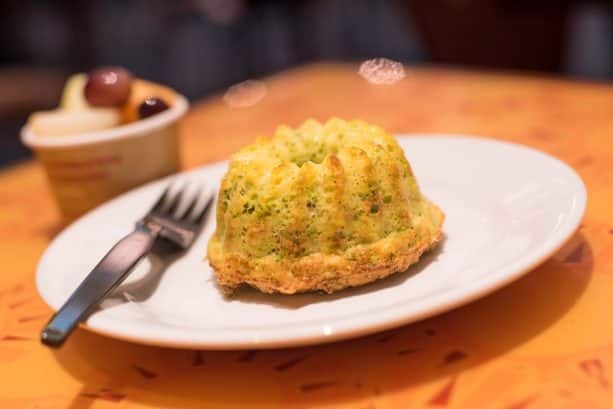 The second is a fantastic Breakfast Broccoli and Egg-White Soufflé served with a multigrain croissant and fresh fruit. 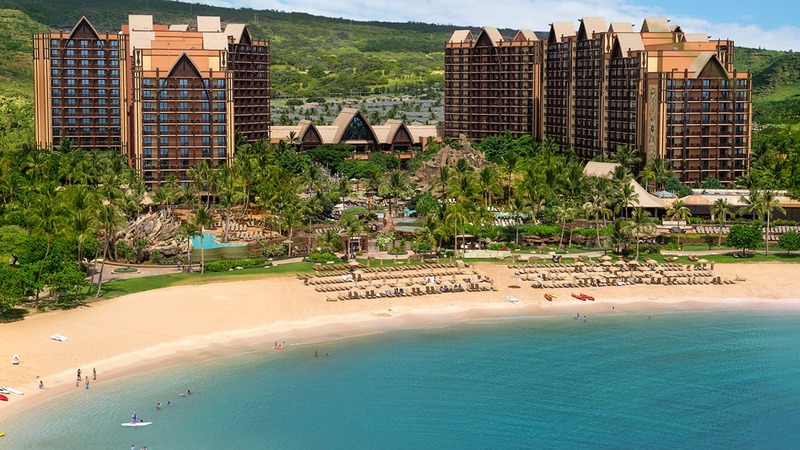 And if you plan to return to Sunshine Seasons later in the day, there are a couple new items on the lunch and dinner menus as well – like the Rotisserie Turkey Breast Club Sandwich that comes with roasted turkey breast, bacon jam, and avocado spread served on fresh ciabatta bread. There’s also the Tuna Poke Salad – a noodle and wakame seaweed salad topped with tuna poke, spicy mayonnaise and sweet soy. And then there’s my personal favorite – the BBQ Pulled Pork Sandwich with coleslaw and garnished with a fresh, crisp pickle! 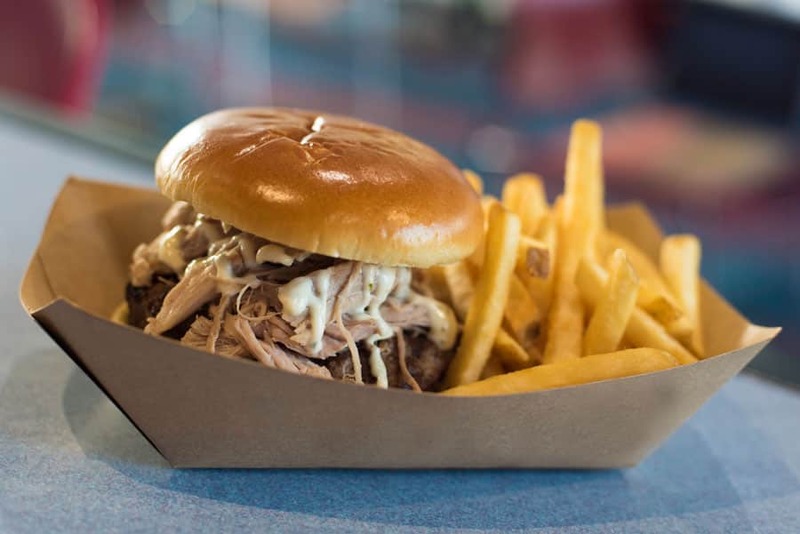 Another good option for lunch would be Electric Umbrella, where a Mojo Pulled Pork Burger, a Brisket Sandwich, and a Vegetable Quinoa Salad have been added to the menu. The Mojo Pulled Pork Burger comes with cilantro and lime aïoli; and the Brisket sandwich comes with a delicious beer cheese sauce. 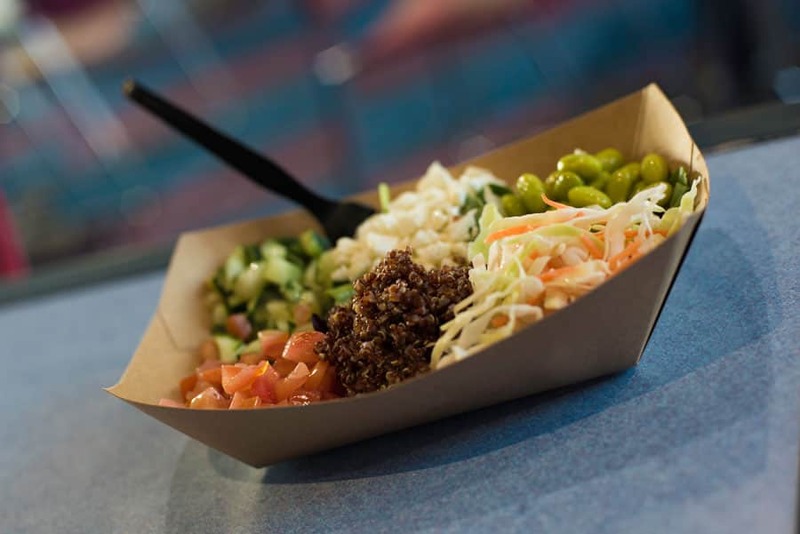 And for a vegetarian option, the Veggie Quinoa Salad consists of quinoa, riced cauliflower, pickled carrots, cabbage, cucumbers, tomatoes, edamame, and agave-lime dressing. And now we enter World Showcase. Starting at Refreshment Port near Canada, you may have noticed that a special poutine has been tempting the taste buds of our guests. 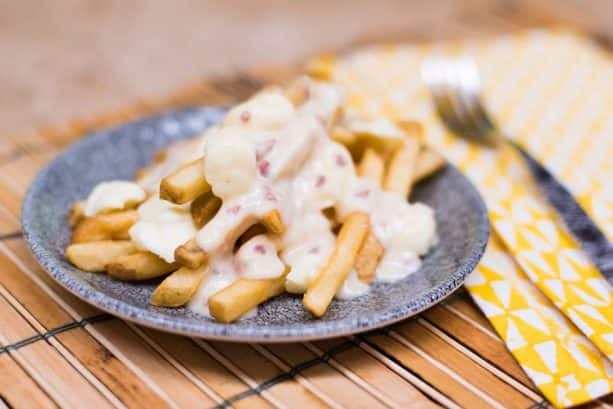 Here you’ll find two new poutine offerings: Traditional Poutine consisting of french fries topped with beef gravy and cheese curds and Signature Poutine consisting of french fries topped with Canadian cheddar-bacon sauce and cheese curds. And you can still get that deliciously sweet Croissant Doughnut with cinnamon sugar and the option to top it with vanilla, chocolate, or swirl soft-serve ice cream. For the adults out there, you might want to try the specialty Bloody Mary! Traveling around to the back of World Showcase, our next stop is at Liberty Inn in the American Adventure. New to the menu are Fried Shrimp and a Fried Chicken Sandwich with lettuce, pimento cheese, and smoked bacon. 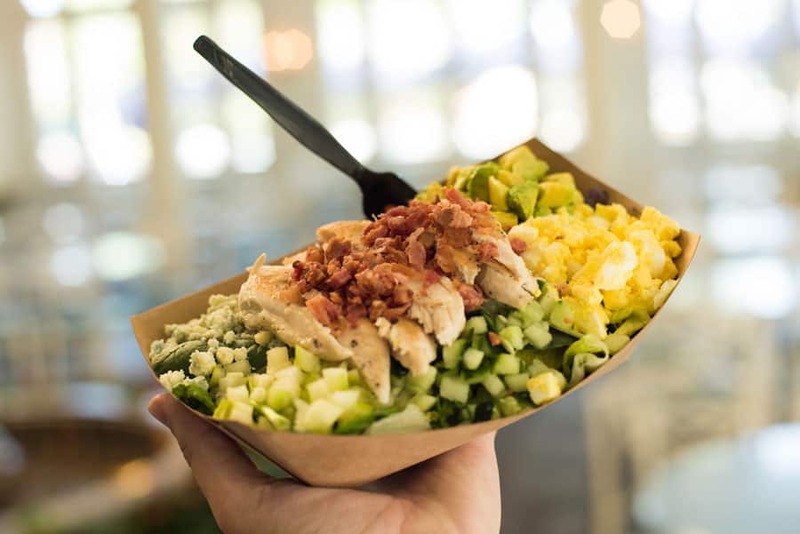 On the lighter side, you can try the new Cobb Salad with warm chicken, green apples, avocado, tomatoes, cucumbers, hard-boiled eggs, blue cheese, and bacon, topped with a sherry vinaigrette. And for dessert, we welcome two new desserts with open mouths: an Apple Pie Cheesecake and a Marshmallow Cookie Crunch Cupcake! Finally, we now arrive in Norway, where the Midnattssol Bakeri is now open for business! Here you’ll find your favorite Norwegian snacks such as the popular School Bread, Lefse, Anna’s Birthday Cake, and Chocolate Pretzels. On the savory side, the Norwegian Club Sandwich and the Viking Dog can also be found at this new bakery location. The Norwegian Club Sandwich consists of ham, turkey, bacon, Jarlsberg, and Muenster with fresh tomatoes, sliced red onion, and lingonberry mayonnaise on toasted multigrain bread. The Viking Dog is an all-beef hot dog served with pulled pork, purple cabbage, spicy mayonnaise, bacon, and fried onions. 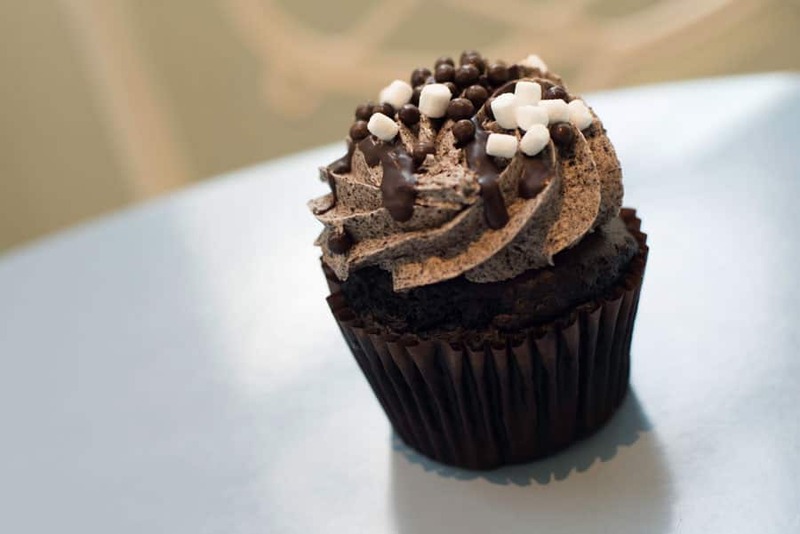 No matter where you go, your day at Epcot will be deliciously delightful with these new eats throughout the park. Come on out and taste them for yourself! And while you’re here, you can also check out the Outdoor Kitchens at the Epcot International Flower & Garden Festival through May 28. To see all of the festival offerings, check out my recent Foodie Guide for all the menus and locations. 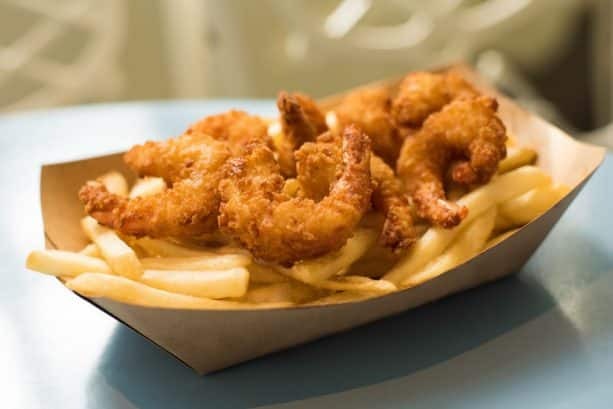 I think this year for our vacation I will make a point for us to eat lunch at World Showcase, we always have a dining reservation there but eat lunch in EPCOT…I’m thinking I could go for the Fried Shrimp at Liberty Inn! I’m happy to see you adding a vegan option to one of your menus. Please keep it up! I tried the brisket sandwich at Electric Umbrella. I loved it. It reminds me of the mac and cheese that I used to get in Magic Kingdom Park in Fastasyland. They put pot roast with the mac and cheese. Yummy! 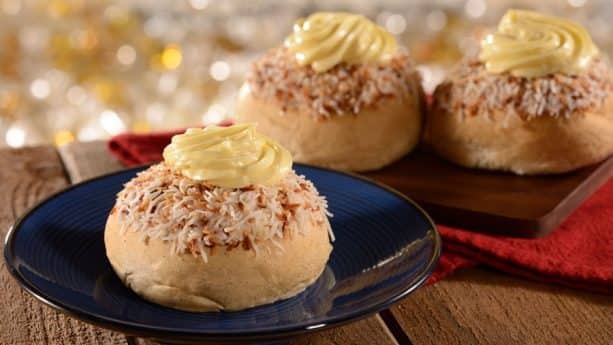 One day I’ll make it to Epcot and try the lefse at the Norwegian pavilion. My half-Norwegian grandma makes lefse every Christmas and it’s one of my favorite foods on the planet. I have to see how your lefse stacks up against my grandma’s!